Our journey through Isaiah takes us to one of the most amazing passages in the Bible. The Lord has timed our arrival at this passage perfectly. We are approaching Holy Week when we celebrate Jesus’ triumphant death and resurrection. This passage is the prophetic proclamation of Jesus’ atoning work and His exaltation. From Isaiah 52:13 to the end of chapter 53, we find a beautiful five-stanza poem. It is the last of the four Servant Songs which are prophetic revelations of the Messiah of Israel. Today, looking back, we know the prophecy is about Jesus. This song is the longest and most amazing of the four. The poem consists of five, three verse stanzas. God speaks and exalts the Messiah in the first and last stanza. Isaiah speaks of the suffering of the Messiah in the middle three stanzas. We will be looking at the first two stanzas of the passage this morning and the rest of the song on Palm Sunday, Good Friday, and Easter morning. The subject of the song is the Messiah of Israel who is in the song 55 times (3.6 times a verse). The Messiah is given two names. The first name is in the first verse; Servant of the Lord. The second name is the arm of the Lord. There are many references to the Messiah in Isaiah using these two names (Isaiah 30:30; 40:10-11; 42:1; 48:14; 48:5-7; 50:10; 51:5, 9; 52:13; 53:1, 11; and 59:16). The best way to understand this song is to see the two truths it conveys; the glory of the Messiah and the despising of the Messiah by people. Each verse illustrates one of these two truths. Glory: The humility and suffering of the Messiah result in His glorious exaltation. God is pleased with the Messiah, and God exalts Him above all things. Because God exalts the Messiah, the expected response we are to have is that we worship Jesus above all things. 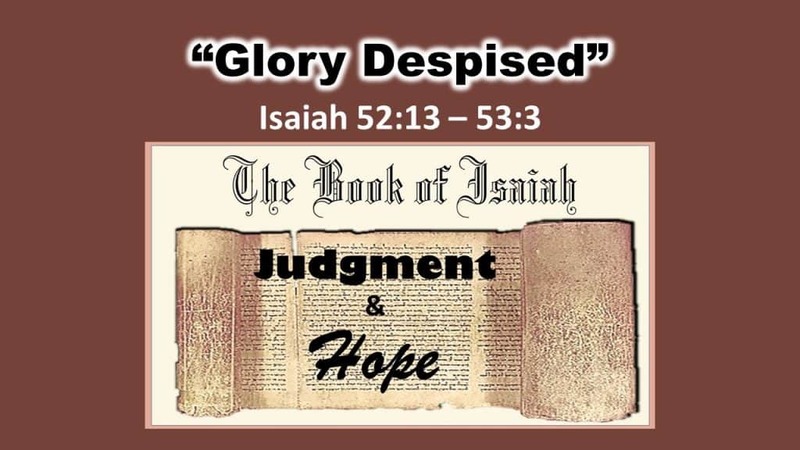 Despised: The salvation of the Messiah does not come about as we expect. Our sinful condition causes us to overlook Him and not recognize His saving work. Because the Messiah brings salvation, the expected response is that we will not despise His work, but we will put our faith in the person and ministry of Jesus Christ. The first stanza of the Servant Song consists of the last three verses of chapter 52. In this stanza, God speaks to us. All three verses speak of the glorified Messiah. God is telling us to look upon Jesus. God points to Him and declares that He will be high and lifted-up. God is making a very significant statement about Jesus. Numerous times in the book of Isaiah, God says that man will not be exalted. Exalted men are looked upon unfavorably by God and He will judge anyone who lifts himself to an exalted position. Listen to these example verses from Isaiah which this principle. This tells us that the Messiah is a very special man who God exalts. Even more significant is the phrasing used by God. The Hebrew phrase for high and lifted up only occurs four times in the Old Testament, each time is in Isaiah (6:1; 33:10; 57:15). Each time the phrase high and lifted up is used it is to describe the Lord God. God is telling us that the Messiah, His Servant, is of equal position to Himself. The Messiah is God Himself. The Messiah is indeed glorious. After God speaks about lifting Jesus in glory to an exalted place, we are confronted with a troubling picture of Jesus sitting in the place of glory. Historians find it difficult to decide which is a worse punishment, scourging or crucifixion. Jesus endures both. When scourged, He is stripped of His clothing and whipped from shoulder to thighs. The whip is specially designed to bring the victim close to death. It has several leather strips weighed down by sharp pieces of bone and metal. When they are done with the flogging, Jesus faces the physical abuse of punches and slaps to the face. He cannot prepare himself for the hits because He is blindfolded. After the scourging and the beating, Pilate brings out Jesus before the chief priests and officers and says, “Behold, the Man!” (John 19:4). A few hours later, Jesus is crucified. There are many gruesome accounts of the atrocity of crucifixion. God proclaims the exaltation of Jesus in the context of His scourging and crucifixion. It is not because God thinks all people who are crucified are exalted. The reason for the exaltation and glory of Jesus is because of His willingness to obey the Father at all cost. Jesus’ willingness to obey is astonishing. His desire to obey God even though the obedience brings Him to a place of scourging, humiliation, false accusations, mocking, and finally His crucifixion. His obedience is nothing short of astonishing. His obedience is to be marveled at and talked about throughout eternity. Be astonished at the Messiah. Incredible means far-fetched, unbelievable, absurd, and implausible. Jesus is an incredible Messiah. We have been hearing about how the Messiah will save the nations since the beginning of the book of Isaiah (as early as 2:2). “The nations will resort to the root of Jesse (11:10),” and He will bring forth justice to the nations (42:1). The coastlands wait expectantly for the arm of God (51:5). In this passage, we hear how the Messiah saves the nations. In Hebrew vernacular, to sprinkle is to clean and purify. Blood is sprinkled on the altar. With this small world, “sprinkle,” Isaiah introduces the substitutionary atonement of the Messiah into the Bible. Jesus will sprinkle His blood on the altar in the holy of holies in heaven and will purify people from all the nations. Jesus saves with the shedding of His blood and having His appearance marred more than any man. Jesus sprinkles His blood and overcomes Satan. He sprinkles His blood and defeats the enemy of death. The blood of Jesus washes away the stain of sin upon mankind. The Lord God further illuminates the glory of the Messiah. Kings have access to the very best of information. They surround themselves with generals and captains to teach them the art of war. They inquire of professors, scientists and medical professionals from the best universities. Kings employ lawyers to interpret the law and the best craftsman to build. Kings question religious and spiritual advisers. But, when it comes to the incredible work of Jesus, they are rendered speechless. Not one of their advisors tells them about the Messiah of Israel. And what they had not been told, they will see and be amazed. What they had never heard about, they will understand. What makes the kings rendered speechless is that Jesus saves the nations with His blood sacrifice. He does not wager a propaganda war. He carries no sword and has no bank account. He doesn’t have the backing of the government or politicians. Neither does he have access to an industrial manufacturing complex. He needs no army or any of this world’s means of warfare to defeat His enemies. Jesus power over His enemies is something that is completely counter-intuitive. Jesus gains victory and conquers with humility. He defeats enemies by laying down His body to suffer. He accomplishes total victory single-handedly. Jesus work is incredible. Jesus ministry of blood sacrifice is incredible. And it is because of His obedience and sacrifice that God exalts His name above all other names. In the first three verses of the Servant Song, God speaks about the Messiah of Israel. God says Jesus’ obedience and sacrifice are astonishing. His salvation is such that it renders the greatest of all men speechless. The Servant of God is worthy of the greatest of all exaltations. What about us? How do we see the Messiah? Is He glorious to us? No. He is not glorious, but He is despised. In the first stanza, God speaks. In the second, Isaiah speaks about our view of the Messiah. Isaiah wonders who has eyes to see the arm of the Lord when revealed? Don’t misunderstand the text. The Messiah is not hidden. The question is who sees Him in His glory? If we tell you about Him, will you believe our message? Who will believe that His salvation work is being marred beyond human recognition? Jesus stands in their midst. Even though Jesus performs signs before their eyes, the people do not believe in Him. John’s Gospel sees their unbelief is “to fulfill the word of Isaiah the prophet which he spoke: "LORD, WHO HAS BELIEVED OUR REPORT? AND TO WHOM HAS THE ARM OF THE LORD BEEN REVEALED?" (John 12:37-38). There are people today who fulfill this prophecy. The arm of the Lord is revealed before their eyes and ears, and they refuse to hear the report. He is in plain sight. They do not listen to the voice of evangelists. They are blind and deaf to the news of eternal life. If we were to walk in the woods, Jesus will not appear to us as a mighty oak or a tall cedar. Instead, He will look like a small shoot growing like a weed in a dry, dusty corner of the forest. Jesus is born in a manger. His parents are not wealthy, but poor. They bring the offering of paupers to the temple priest when He is born. He grows up in Galilee which is an undesirable area of Israel. He owns no real estate or property. He doesn’t carry a wallet. Jesus is not like Saul, who stands head and shoulders above everyone else. He is not a handsome young man like Joseph or David. Jesus is not like James Bond, King Arthur, John Wayne, or another stereotype of a man’s man. Jesus is like the guy in school who is picked last on the team and will never be a finalist for homecoming king. People find Jesus repulsive having no earthly majesty. People find Jesus to be beyond repulsive, He is despised. He is discarded and counted as rubbish. He is not the jovial life of the party, but a man of sorrows who we kick to the curb. If we were to walk down the street and see Him, we would turn our face as though He is a disfigured leper. His very appearance is uncomfortable to us. If there is a contest to vote for a Messiah, Jesus will not be a final contender. He will not be chosen as a contestant. Think about a simple event such as going to someone’s house for a meal and fellowship. A person walks into the room, and our face will light up. We are glad to see the handsome man or beautiful woman. We admire the attire of the well-dressed. We marvel at the words of the smooth-talker and knowledgeable companion. We enjoy the company of the guy who makes us laugh. We honor the fast runner and successful athlete. We especially adore those who like us and give us unending compliments and attention. We all want to be that person! But, do we see people as God sees them? Without Christ, all these people are sinners. They are self-centered, selfish, deceitful, hateful, and rebellious people. None are good, no not one. But that is not how we see them. We buy their books and movies and listen to their music. We mimic their habits and tell our children to walk in their ways. The innocent, sinless, all-loving, all-powerful, and sovereign King of the Universe, steps off His throne and comes to earth. He gives us the air we breathe and forms and knits our body in the womb. Jesus walks into the room and we turn our face away. We avoid His glance because looking at Him is too uncomfortable. We look at the host and ask, “who invited Him?” We move away from the Man of Sorrows so we can sit next to the class clown. We give more respect to the drunkard at the punchbowl than we give to the King of kings. How far we are fallen! We have no concept of the extent our values and priorities are distorted. We are once a creature who walked in the garden with our Creator, looking forward to His appearing and enjoying His company. But now, the Creator walks in our midst, and we don’t recognize Him. We treat God as scum as we gush in admiration for the devil. Our eyes avoid the Creator while we are glued to images of fallen creatures. We despise the Creator so much, we scourge Him and nail Him to a tree. We are wretched, depraved human beings. MAIN IDEA: Do not despise the glorious work of the Messiah but worship Him for His salvation. The most important thing we may do after hearing this passage in God’s word is to recognize our view of God’s glory is tainted by sin. The more we understand the depth of our sin, the more we realize how amazing is our Savior. The Son of Man, who we despise, willingly endures the shame and mocking. He outstretches His arms so we may nail Him to a tree. He hangs there in shame before the public, and the Man of Sorrows offers forgiveness to those who are crucifying Him. He bleeds for our salvation. He is marred for our sin. It is our grief and sorrow He carries. There is only one who is worthy of our worship and praise. Worship Jesus for His atoning sacrifice for our salvation. His work of salvation is astonishingly complete in every way. © 2017 Christ Community Church. All Rights Reserved.